The L’Oreal Infallible Foundation Blender is quickly becoming one of my favorite and most used makeup application item. I’ve mentioned it in my October Favorites after I purchased it during a small drugstore haul. After seeing a few beauty YouTubers rant and rave about this sponge, I finally decided to pick it up and try it. At my Walmart, it was $6.97 and came in a plastic box. 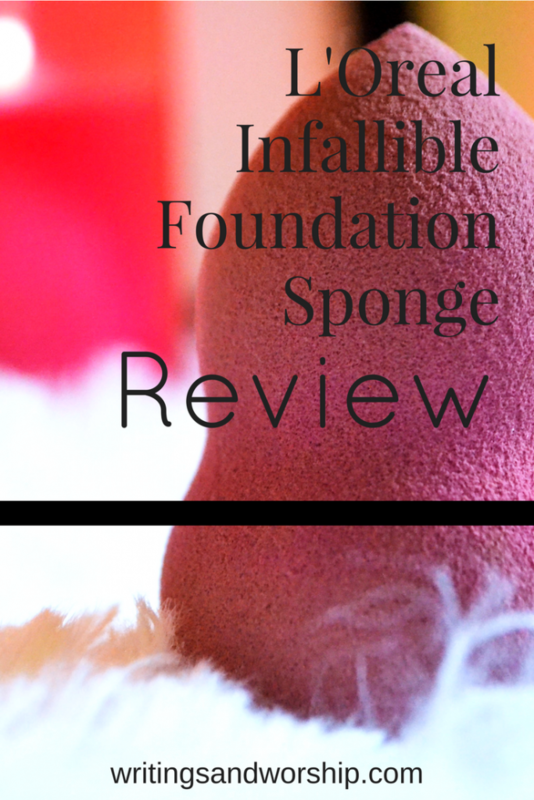 The foundation sponge is pink with a point on one end and a flat bottom on the other. These two sides make it an overall perfect sponge for all my foundation needs. It came be used dry or dampened, but I highly recommend using it damp. Today I thought I would share a 3 reasons I love this sponge, review its use, and end with an overall rating of it. I know that everyone has their own opinions but I love doing quick little reviews like this sometimes! And I especially love to brag on a new product I have fallen in love with, like this one! Reason #1 – Like I mentioned above, because of the dual ended sponge I can use it for all my foundation needs. Normally I have to use one brush or sponge for foundation & one for my concealer. With the bounciness and low density of this sponge, I can squeeze the pointed end and blend in my concealer perfectly! It’s really a multi use sponge- I bet it would work for perfectly for cream contour as well. Reason #2 – The size almost doubles when dampened. While most sponges are used damp, this one just flourishes when wet. The increase in size also increases the bounciness of the sponge. I cannot stand a dense foundation sponge and this is the lightest one I have used so far. The sponge is light and easy to manipulate by pinching and dabbing on the skin. 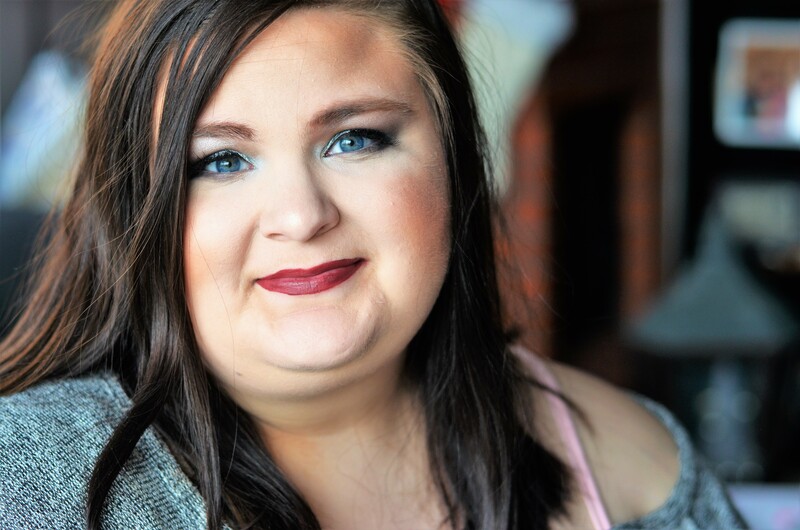 I used the IT Cosmetics sponge and hated it; it was so hard and felt horrible on the skin! I must say, this one is softer than the Real Techniques sponges so far. Reason #3 – The price. How perfect is a makeup sponge that is amazing for less than $7! I cannot even image buying beauty blenders…normally I like to try the “name brands” at least once but I have no desire to pay $20 for a sponge; especially when I love, LOVE one that is less than $7. I prefer to have a few at a time so I can change out and clean them…with this price, its very possible. I’ve mentioned it briefly but this foundation sponge is exceptional not just in price but use. It applies foundation perfectly and evenly. The sponge itself is soft and a low density which makes for perfect bounciness. It’s both thick and soft at the same time; meaning, even though it is soft and light it is still very sturdy and good quality. I haven’t had to crack, peel, or have any of the sponge come off so far and I’ve used it for over a month I believe. If you like lighter sponges, this one is for you! The size of the bottom of the sponge when damp is perfect for applying foundation all over and quickly. It takes me no time to cover my whole face and blend it in. I will rate the sponge out of five; five being the best possible. I don’t give those numbers out lightly, I give them out of pure love for this product. Maybe it isn’t for you, but I hope I gave you a little insight into this awesome drugstore sponge. I highly recommend this if you’re looking for an affordable alternative to the beauty blender! It is worth every penny and I have gotten great results from it so far. Have you tried this sponge? Let me know what you thought of it! Yes! The size is perfect once wet. You really have to squish it under water a couple times then you’re good to go! I’ve been wanting to get into liquid foundations and use a sponge so will definitely hit this one up first! Wow I need to get this! Blending is always a struggle for me. Thanks for sharing! So glad you loved it! I’ve been on the market for a less expensive beauty sponge. This is great!